Want to Stay in Barny? We can accommodate up to 33 people throughout our 5 bedrooms. The rooms are clean, modern, bright and provide cost effective accommodation. They are very well equipped. We have wi-fi across the Hub. It is approximately 10 minutes walk into the town centre. Here you can shop 'til you drop. We welcome hen and stag groups, guests at private parties and attendees at any function. Call us to discuss your requirements on 01833 690150. Attendees on courses in the area may book with us direct. A minimum of two people are required to stay at any one time and at least 5 days notice must be given. We welcome individuals and groups to stay. 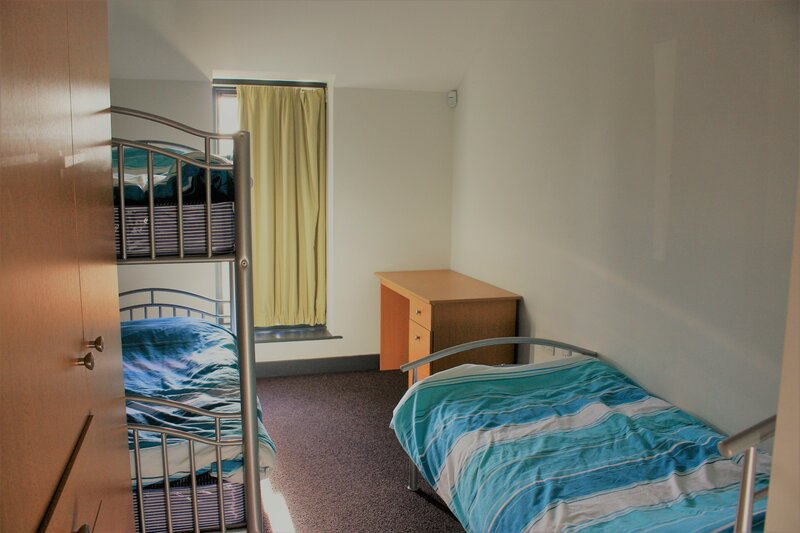 The Hub boasts 5 bedrooms which sleep between 3 and 8 people in a combination of bunks and single beds. We can provide bedding or are happy for you bring your own if you are keen to keep costs down. Each bedroom is equipped with storage; wardrobe and drawers; a sink; mirror and good lighting. Curtains are black-out lined providing a peaceful night’s sleep for guests. 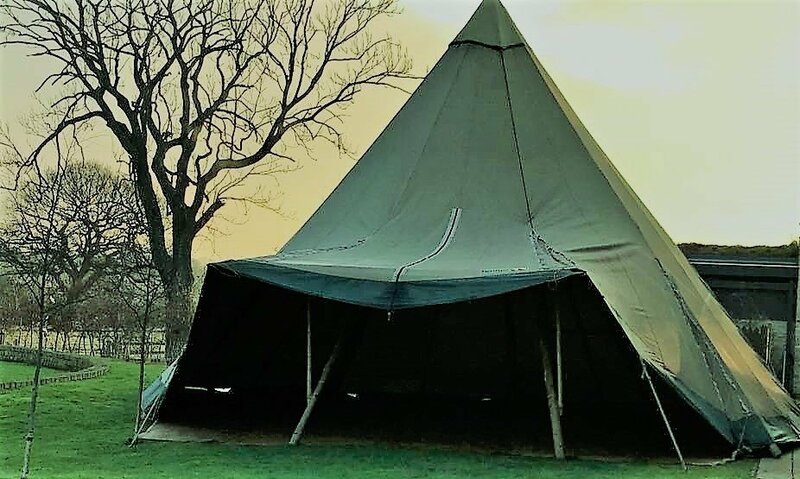 Camping is available at the Hub and our facilities provide safe, sheltered site for camping with access to all facilities inside the centre including bathrooms and the kitchen. Outdoor cooking is allowed on the hard surface of the amphitheatre and any campers wishing to use the indoor kitchen can do so by prior arrangement. Camping at the Hub is particularly suitable for Duke of Edinburgh expeditions. All of our staff are youth trained. Leaders have the option to camp outside or book a bed in one of our inside bedrooms. Walkers are welcome to camp and the network of long and shorter distance footpaths surrounds us here in Barnard Castle. Well behaved dogs, which must be kept on a lead, are welcome. Having a party? Want to visit and stay with more than 33 friends? Both outside and inside camping is available by prior arrangement. Businesses can book the whole of our centre for corporate and training events. Learn more here. Call us on 01833 690150 and we can discuss your requirements. Separate bathrooms for male and female guests are adjacent to the bedrooms. We also have shower and bathroom facilities for disabled guests. 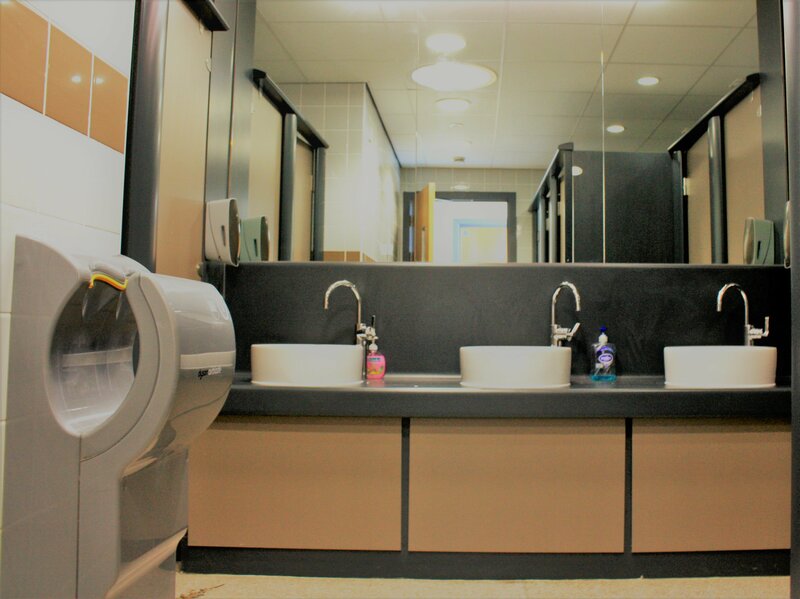 Bathrooms are clean and modern, stylishly equipped and well appointed.